One of the greatest strikers in the history of world football,Ronaldo, has selected his dream XI this week. Ronaldo hung up his boots back in 2011 following a stint with Brazilian club Corinthians. 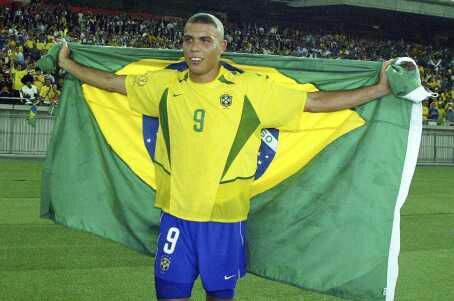 Ronaldo won the World Cup twice, in 1994 and 2002, and his 15 goals in football’s premier tournament is a record. The two-time Copa America winner played for some of football’s most-famous clubs, and also had spells at PSV Eindhoven and AC Milan during his 13 years in Europe. Ronaldo won the European Cup Winners’ Cup with Barca in 1997 and the 1998 UEFA Cup with Inter, scoring in the final of both competitions. When picking his dream XI, Ronaldo went for a 4-2-4 formation laced with supreme attacking talents. However, the Brazilian star failed to pick his namesake, Real Madrid icon Cristiano Ronaldo, in his XI. When it came to the forward positions, Ronaldo picked himself alongside Brazilian icon Pele in the attack. Argentina’s two greatest players of all-time, Diego Maradona and Leo Messi, were picked to play on opposite flanks to support the two Brazilian strikers. Two of the world’s greatest playmakers were picked to work in tandem in the middle of the park: French World Cup winner Zinedine Zidane alongside Azzurri hero Andrea Pirlo. When it came to the back four, Ronaldo selected two Brazilian full-backs and two Italian centre-halves. Roberto Carlos and Cafu fill in at left and right back, while Paulo Maldini and Fabio Cannavaro provided the steel at centre-half. The final spot in team went to Italian legend Gigi Buffon. See Ronaldo’s dream XI below.